I read that I'll need a logic level converter like this to run an ESP8266-01 from the Uno. The ESP-01 has 8 connections but this has only 4, how come? Will I get the same functionality? If I'll use this adapter, then I won't need the logic level converter? The module has a 3.3V voltage regulator circuit and 5v-3.3v onboard level conversion circuit. Yes, the module can be used with Arduino UNO R3 or compatible board without needing an additional level converter, as it is integrated in the module. The module has Vcc, GND, TX and RX, so it means it uses a serial protocol for Arduino communication (and you will need two pins in the Arduino). Other pins in the ESP-01 are not needed in this scenario, but you still have access to them via the 8-pins female connector on the module. It's totally plug and play. This how you connect a standard ESP-01 with an Arduino. The module you are looking at include all the resistors and also connect the CH_PD pin to Vcc. You only need to connect four pins. It saves you time, money and space. 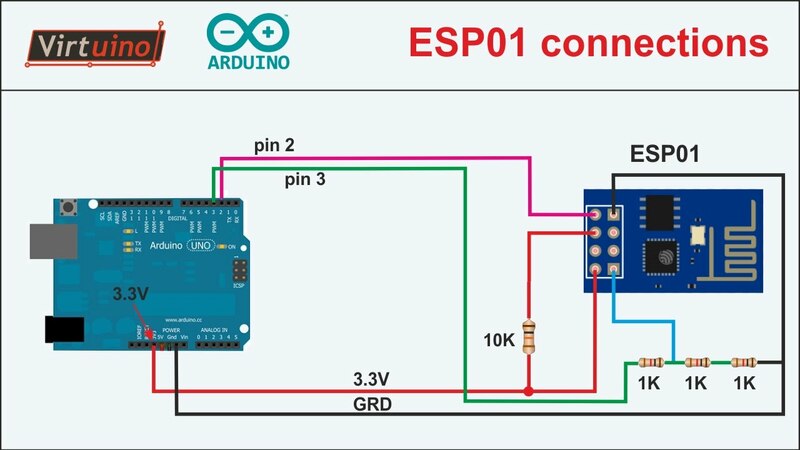 The ESP-01 is a microcontroller that works only with 3.3V. If you don't use a logic converter, it will not work correctly with 5V on TX and RX and you might even damage your module if you use it like that. So answering your second question, the important thing to keep in mind is that you need to power it with 3.3V and the logic level of the data you send must also be 3.3V. As for the number of pins, the 4 pins are for VCC, GND, TX and RX. These are the only ones you'll need to connect with Arduino. The other pins on the ESP-01 are CH_PD, RST and two GPIOs. I used in one of my projects, instead of a logic level converter, some voltage dividers on the pins, Arduino inputs don't mind the 3.3v, it works just the same. Not the answer you're looking for? Browse other questions tagged arduino-uno esp8266 voltage-level adapter or ask your own question.